So, I made my new pj pants this week. 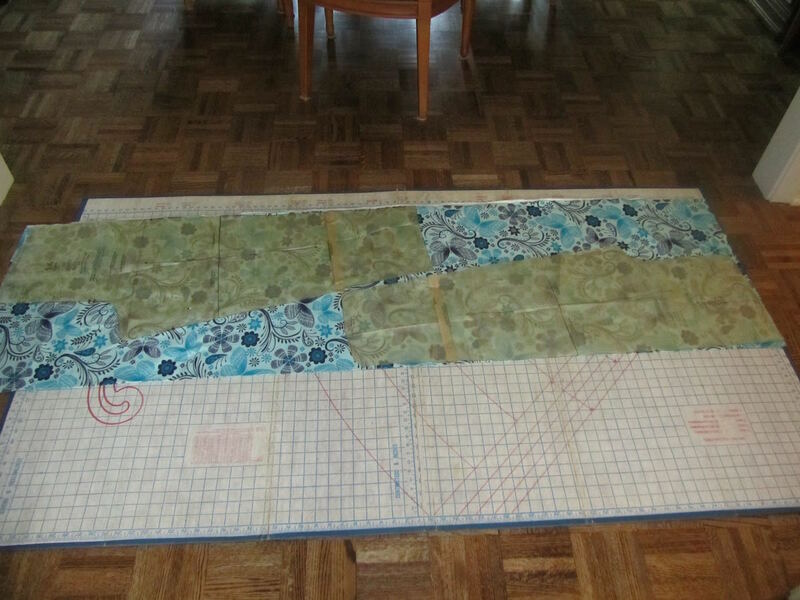 Before I went to the fabric store, I got out my pattern and laid it out on the cutting board to see how much --er, how little fabric -- I would need/have to buy. I hate having all that leftover fabric, so I try to make as close a guess as I can. To make the best use of fabric, I would need to reverse the direction of either the front or the back of the pants. So, I looked for an all-over pattern whose direction could be reversed, no nap or one-direction design on the fabric. 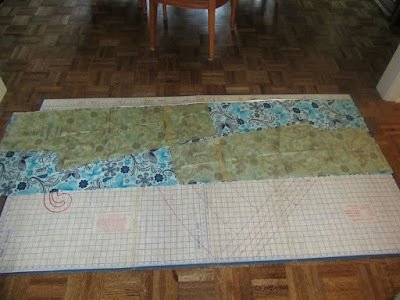 I got to the cutting table, and debated over whether to get just an inch or two more. I went with my original measurements. I do think there is such a thing as being too cheap. And I think I was flirting with it that day that I bought the fabric. On to cutting my fabric. I laid it all out, and wouldn't you know it, this was a very close call on the amount of fabric. The pattern just barely, barely fit on the fabric. I had to pin and re-pin a couple of times to get the pieces to fit. I should have gone with that extra inch. It would have made the cutting so much easier. In the end, I did get it all to fit, and got my fabric cut. But that was a squeaker! I do like the way pattern instructions are written. Everything is broken down into steps. I could tell myself, "today, I'll cut the fabric and do Step 1." This makes the whole project feel much more doable, for me. I have plenty of leftover scraps, just not at the ends. I am thinking, though, I've saved the scraps from several pairs of pj pants, all flannel, in varying colors. My kids are getting older. One of them could get married, start a family, hmmmm . . . Not pushing, of course. But eventually, I'll be able to turn some of these nice, soft, flannel scraps into patchwork baby blankets. Like I said, not pushing or anything. Here's how the pajama pants turned out. "It really, really helps to use the same pattern over and over. I've found that I can practically make these pants without the instructions. I have confidence in my ability to figure out this pattern, which is a big help in completing this project without a hitch!" Not exactly how everything unfolded. But then, aren't hitches to be expected? But I persevered. An extra 30 minutes, unpicking a seam in the wrong place, and I was back on track. Not a bad project, though. Including cutting out the fabric and all sewing, this took me 2 afternoons. And I even had thread and elastic at home, so I was only out the cost of the flannel, which was on sale at Jo Ann's earlier this month. Cold wintry nights? Bring it on!!!! Those are pretty! There are so many fun printed flannels available right now. I am not (have not been) quite so diligent as you when thinking out fabric requirements, but I was annoyed when I purchased flannel a couple of years ago to make pjs for some family members and realized that I was just a tad short -- I had made the same pattern previously using a wider width of fabric and forgot to take that into account when purchasing the flannel at Joann's. I ended up making pillowcases, but I was annoyed with myself for quite some time. Right now I am trying very hard to NOT purchase any additional craft or sewing supplies -- when I worked full-time in a fairly demanding (time & energy wise) job, I allowed my dreams of "free time" to dictate my purchases and now have a TON of high quality quilting fabrics that I need to actually put to use and make things. I'm allowing myself the purchase of necessary items to finish a project, but I'm trying to come up with alternatives first. I'm aiming for a mostly handmade holiday, so sewing time is getting kind of serious around here! Thank you. I like how they turned out. Oh no! That's almost what happened to me, this time, with cutting it so very close on the measurements! At least you got some nice pillowcases out of it! I've gotten much better about not buying supplies for crafts or sewing, when I already have a surplus, and many projects to do. I got myself overstocked with supplies a while back, and still have a significant project for the family room to tackle, maybe next month. I keep telling myself, no more fabric until I get that job done. It's hard, though, because buying fabric is a lot like buying candy, to me. It all looks so pretty and tempting. Your homemade holiday sounds like a very wise use of your surplus supplies. And everything will be so appreciated by your family! Good luck with it all! I haven't sewn a garment in ages. But I may take up sewing again in retirement since I have kept all my fabrics from over 20 years ago when I sewed because doing so was cheaper. Recently I have been buying fabric again from Savers thrift store, paying no more than an average of $1.50 per yard for costume type fabrics for my granddaughter's sewing interest and wool and batik for my rug making. I am still collecting yarns and fabrics and have nowhere near what I need to begin. So when you speak of scraps for your future sewing needs (no pushing lol) that brings smiles! During the past 20 years, my husband has asked countless times when am I going to dump my bins of fabrics but I held on saying I'm going to need them for projects like quilting one day...I'm glad I did. The fabrics have held up well in plastic bins, no signs of degradation. Best of all they are vintage quality. 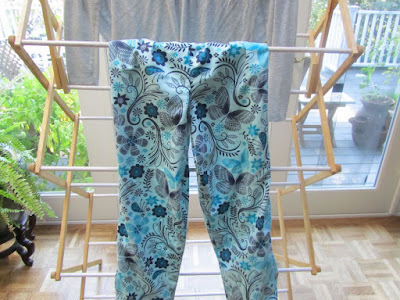 Your pj pants came out beautiful and there is pride and satisfaction of having made it. I guess I love handmade. You and I must have been typing at the same time this morning. A lot of my stash is the same vintage as yours, plus I have some from my mom that's another decade or two older. I've been so happy to find out that it's almost all weathered the years very nicely, and it was all bought in the old days when, as you mentioned, home-sewing was still actually cheaper! I'm very glad to have it all now, and thankfully my hubby hasn't even been too skeptical about it all these years, either. Lol...that's so funny...I guess my frequent daily replies on Lili's blog has created a real life personna of myself. I have visions too of what you must be like, in.fact when you mentioned that you worked at a fabric store, I immediately had a mental picture of a nice, chatty Sara like the women I remember from when I frequented fabric stores. Just a side note...I don't know if you were ever instructed to cut on the grain, but I recall learning from my college professor in Fashion Design (didn't we who sewed thought we could all be designers?) That the fabric store should always cut pieces on the grain to minimize fabric waste from any grain skewness on the bolt. Then after washing out shrinkage, we were told to stretch the fabric on the bias to straighten the grain. That's all to be sure a yard is as close to a yard of cutting goodness. I too have vintage fabrics from my mom, many were fabric samples from the 50s or earlier. She always told me I should keep those. That's probably who I got my hoarding tendencies from. I have some fabric that my mom bought in the 70s, and it still looks good. I have never figured out what to make with it, but I can't bring myself to get rid of it, it's now sentimental. that's too funny about the dream! I'm so glad that you and many others feel so comfortable posting here. I feel like your all sitting in my living room, chatting away. I'll go get the fresh pot of tea --carry on, ladies! We do get a bit of a feel for folks who post a lot places we visit, don't we? The internet has both reinforced my feeling that most people are nice, and that some people really aren't. When I worked fabric and crafts, I worked with a gal I'd known (and still know) from kindergarten. We were young, it was a small town, and it was a lot of fun. We were friendly, and we tried to always be nice... but we had flat-fold tables that some people ransacked with clearly no concept that we spent all day re-folding those when they were done. We had trouble treating those people with quite as much courtesy. Lili, those came out darling! You'll really treasure those this fall and winter! Laura, I could appreciate your comment about your accumulation of materials. I have a pretty good fabric/yarn stash at present, too (from working in a fabric/craft store, inheriting my mom's stash, etc. ); and I've been working hard to see my old stash with new eyes. I've been happy that I've come up with new uses for things I bought for other projects a long time ago, and didn't ever get to. Hope that your Christmas sewing is a bang-up successs! As for cutting things close, I feel both of your pain, Ladies. I don't like to buy 2 1/2 yards of something when 2 will do. I have a new use for remnants, but I still feel it's usually just wasteful to have a little chunk left that's too much for a matching scrunchie or hair bow, and not enough for much of anything else. Also, like most seamstresses, I pride myself on my ability to usually cut a pattern out a lot more economically than the pattern suggests. On the other hand, I have developed, over the years (and with good reason! ), a tremendous fear (okay, maybe only serious skepticism/cynicism? ) of figuring my pattern needs to the centimeter, and then ending up at home with a fabric that's cut way off kilter on one end, has a serious flaw or joining in the middle, and/or shrinks excessively or isn't quite as wide as it's listed. So, I'm always conflicted now between pinching my yardage pennies until they squeal, and trying not to risk a piece of fabric turning out to be totally useless for what I bought it for because I (literally and figuratively) cut things too close for frugality. Lately, Lili, I'm tending toward buying that "extra inch". I hate it when there's useless overage, still; but not as much as I hate it then it really won't fit. I do think next time around, I'll opt for 1 extra inch, just so I can have more flexibility in the layout.It didn't turn out to be a big deal, but I did spend a lot of time pinning and re-pinning. 1 inch would have only cost 11 cents. My sanity may be worth about 11 cents. Being as we are talking about PJ bottoms, (not a garment on display for the general public) If the pattern wouldn't fit the yardage, you could piece some of the scraps from the side and make a cuff or band around the bottom of each leg. I too have a stash of fabric purchased for one project but not used. It has taught me to think outside of the box when it comes to layout. I was considering doing something along those lines -- a band at each pant leg bottom. It would have been fine. And that is also a great idea for conserving fabric, should someone want to make pjs, w/o much wasted scrap leftover! You're absolutely right -- it's just pjs, and whose checking, anyway?! Love you new PJ bottoms. When you talked about making them before, I checked into the pattern that you and several others use because I wanted some pants just like that. However, at that time the pattern was more expensive than finding some on sale. I'll have to take another look and see if there are some cheaper ones available now. definitely shop for and buy a cheaper pattern, if this one is more expensive. Pj pants are simple, just 2 pattern pieces. There's nothing in them that requires a more expensive pattern. I think I bought this pattern on a 99cents pattern sale. Jo Ann's fabrics often has sales on patterns, and my guess is that every single pattern manufacturer has some version of a pj pant. I love my new pj's, too. While I don't want it to get cold, here, I am looking forward to wearing them. Still too warm, now. came out really cute! Agree, if too short, add a few inches of fabric at each leg bottom, creating a band or cuff. I've been also wanting a pair of Christmas pj pants, and may just plan on making a band/cuff at the bottom just to save fabric and use some of the scraps that are in the center of the yardage. One of my daughters has a pair of striped pjs, and the bulk of the legs, the strips are vertical, but for the band at the bottom, the stripes are horizontal. A cute look, and could look intended, if I find a Christmas flannel that I like in a stripe or definitely a vertical print. Very nice! I love the fabric pattern you chose; should look very nice with the top you had gotten earlier.